As you might have read last week, Lady Sybil, one of our chickens, is hurt. I was of the mind that nature needed to take its course, but my husband? He wants to do everything possible that he can to make sure that Sybil gets better. And I don't want to make myself look bad or anything...but I'm not that hands on about it. Not like he is anyway. So, after a few days of taking my hands off approach of letting Sybil just hang out in her cage and live and stuff, my husband was ready to be more active. Some of this had to do with the fact that I went over to my farmer (who provides me with produce for canning) and told him about my chicken. He asked, "Is her leg all out to the side?" I said it was and he replied, "Then it's probably broken." The words "probably" and "broken" were all my husband needed to hear. He got right to work on making a splint for Sybil's leg. I had all kinds of practical concerns about the splint like "Will Sybil be able to sit properly?" and "Will it be uncomfortable?" Actually, I was totally against the splint, though, it was mostly because I didn't want to help because I was being lazy. While my husband splinted the leg, I watched. And took pictures...because I thought you might all enjoy a little update our beloved Sybil. Well, my husband's beloved Sybil, anyway. Wanna see the pictures? Of course you do! My husband cut an old plastic hanger to make the splint, which, if you ask me, was kind of ingenious. It fit the shape of her chicken leg perfectly. Hehe. 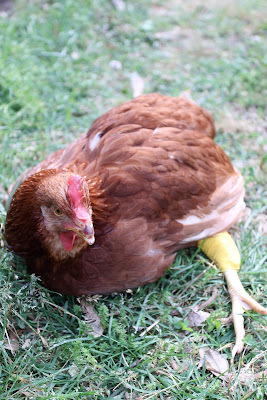 Chicken leg. This is O'Brien checking up on Sybil. O'Brien and Sybil are pals, but really O'Brien was fascinated by the color of the tape as well as black shiny hanger pieces, which she pecked at. Wrapping it up. I have to say that Sybil was a good patient. She barely moved and only clucked once. 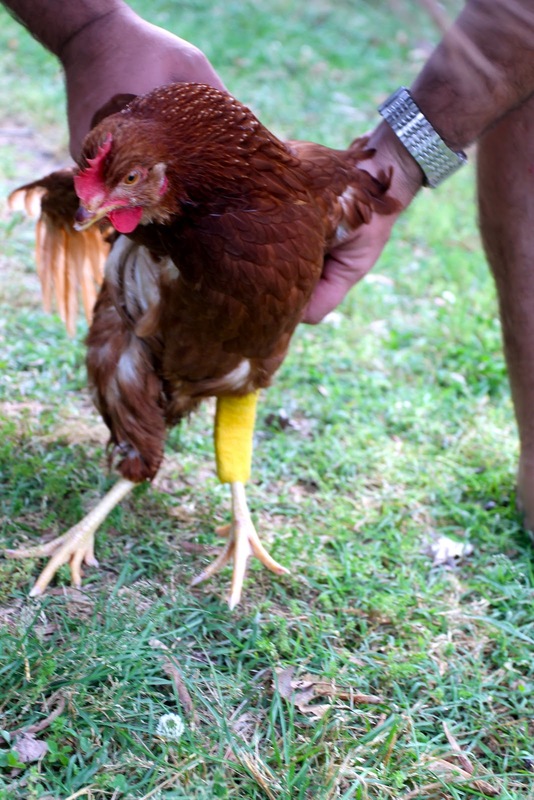 When he first got the splint on, Sybil was dangling her leg out there like this. I started cracking up because, frankly, it looks ridiculous. Now she was getting more comfortable, after my husband gave her splint a little bit of a loosening up and a small shift. He is totally determined, I will give him that. Over the next few days, we noticed that Sybil did try to stand up. 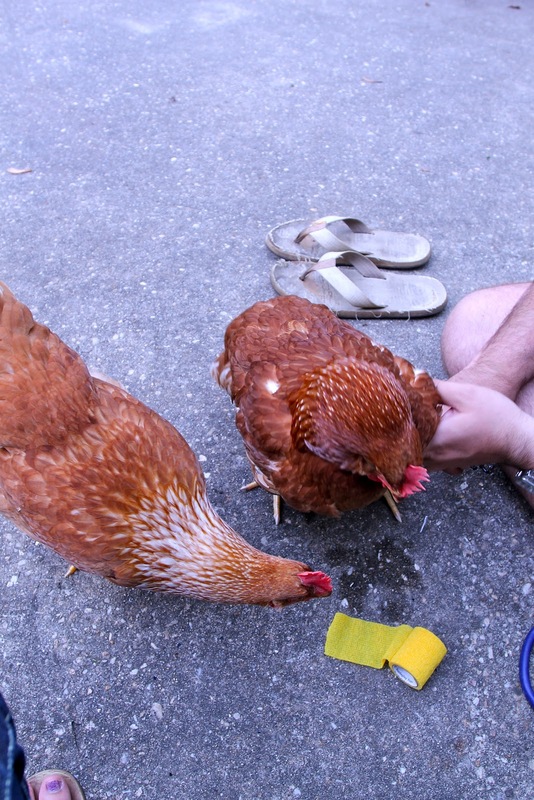 She sort of stopped eating and drinking and then my husband took the splint off. Now every time she tries to stand up, which isn't often, she face plants which sounds sort of funny, but is pretty pathetic. I told Sybil she has until Monday to get miraculously better or die on her own. After that? I'm thinking it's time to stop delaying the inevitable and put her out of her misery. Hi, what happened to poor Sybil in the end, did she recover? Sadly, lady Sybil had to go to the giant chicken house in the sky. 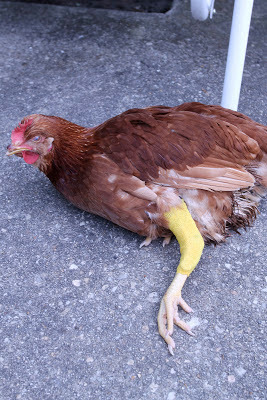 It was a tough loss because she was our first chicken loss. 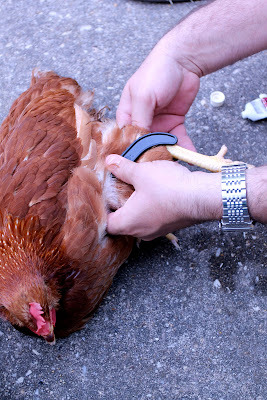 Since then, we've been growing used to losing chickens as an inevitable part of owning chickens!